Developing and supporting this plug-in takes a lot of time and effort. And please, do not forget to register your copy. Another fix for the authentication sequence. Fixed the issue with uploading to a new album. Now the plugin is compatible with the new address of Costco's server. Fixed the issue with authentication (after another change at Costco's backend). Fixed the "The requested resource no longer exists on the server" error. Fixed the issue with uploading photos (Mac OS). The module responsible for back-end communication has been completely rewritten to the new Costco API. Now the plugin support Publish Services with the ability to import existing online albums. 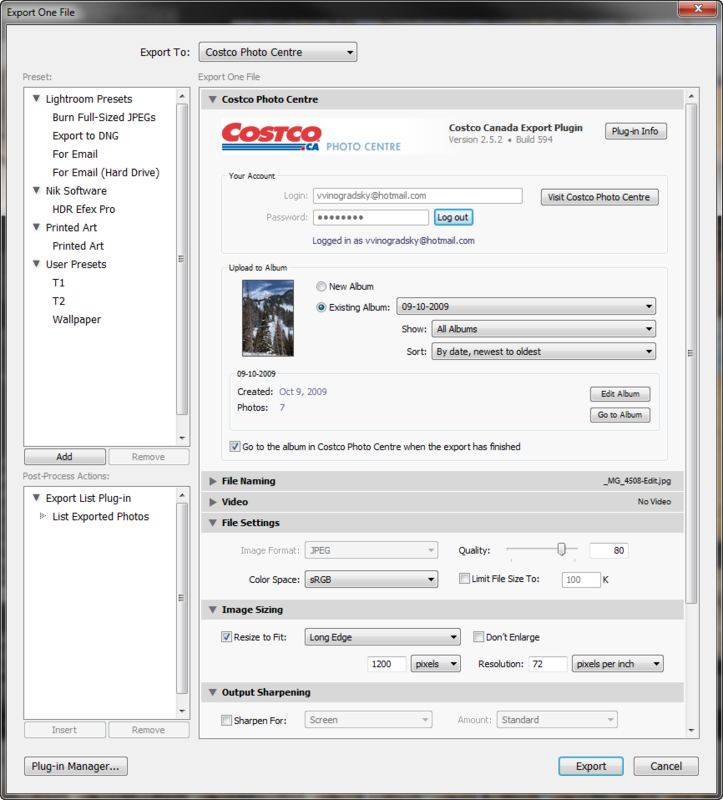 Upload size limit increased to 25 MB per photo to match the new requirement of Costco Canada. Fixed the link to the registration page. 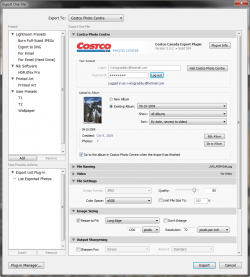 Added support for the new authentication scheme recently implemented at Costco Canada. Fixed the issue with uploading photos to an empty album. Fixed the "Export with previous" functionality. This update restores the operations after recent changes at the Costco back-end. Fixed the issue uploading to existing albums, caused by a recent change at Costco Canada web site. Fixed: Exporting multiple images by choosing "New Album" prompts you to enter the name of the album for each image. Also caused by the change at Costco Canada. The plugin no longer allows creating multiple albums with the same name. Code refactoring amd improved server error handling. Fixed: Costco Canada implemented another change on their back-end and broke my plugin. Remove the CostcoCaExport.lrdevplugin folder, then install the update using the new installation packages. Restored the plugin's operation after a recent change at Costco's back-end. Fixed the "assertion failure" error when uploading to a new album. Added metadata fields for keeping track of photos uploaded via the plug-in. These fields store the upload status, date and time of the latest upload, and the album URL. You can access these fields in library filters, view them in the metadata browser (as “Costco Canada Metadata” tagset) and in smart collection filters. Fixed the "Export with Previous" behavior. Fixed the error when you cancel out of the "Create New Album" dialog. Fixed issue with page caching on Costco's side - some images would take a few minutes to appear in the online album after the upload. Fixed an itermittent issue with authenticating the user. The plug-in now requires a small registration fee to cover the costs of continued development and support. Now authentication errors are displayed correctly. Improved error reporting for Internet connectivity related issues. Fixes several issues caused by a recent internal change in Costco CA service. Added validation of Image Sizing settings. The plug-in will issue a warning if the dimensions of rendered photos are outside of the 500 - 10000 pixels range. Re-designed layout of the Export dialog to provide a better placement of album actions. Fixed the "Unexpected Server Response" error in some additional situations. This is a quick fix for the "Unexpected Server Response" error caused by a recent change in Costco CA web service. Fixed an issue with uploading to a new album after performing an export to an existing album. The plug-in is now compatible with Lightroom 3. Fixed the issue with uploading photos caused by a recent change to the Costco Photo Centre service. Improved the export dialog’s layout to make status messages more visible and consistent. Implemented compatibility with Lightroom 3 Beta. Fixed the issue with Costco server rejecting certain requests from the Mac version of Lightroom. If you would like me to fix a particular issue you’re having, I’d be glad to put time and effort into getting this solved. However, I need to have a little bit more information than “forget it!”. If you want my help, please explain what exactly isn’t working. because the main costco.ca site and the photocenter need two separate registrations. Please report this error to alloyphoto. Why isn’t it exporting? Thanks! Seriously though, see the Support section at plug-in’s home page and send me (alloyphoto@alloyphoto.com) the log file so I can see what’s causing the error. Hi there! wow a plugins for costco.ca, finally !!! Well it seem to works just fine with Lightroom 2.7. But i wasn’t able to select any of my existing album, so i created a new one “test” and now i can see my picture uploaded in it. It’s a little bug? Costco Canada recently made some changes to their online service, and the existing plug-in may no longer work. I am going to modify the code in the next couple of day and release an update. Other than that minor detail, you’ve created a really nice plug-in! If there is one, then it must be imposed by Costco, not the plug-in. How exactly does it manifest itself? Whether or not I use your plug-in, or the java uploader at the Costco website, the filename gets truncated to 15 characters. Of course, I can still modify the title afterwards, but this will be a pain, as I have 500 photos to re-title. Oh well, your plug-in makes it worth the effort. Thanks again! I just used the plugin for the first time today and noticed the image name of my photo had been truncated by 2 characters, down to 15. I uploaded the same file using the Costco uploader and the same thing happened. To test if there is a character limit I changed the image name to 17 characters long (the length I need), then 20, then 21, and there was no problem, so it must be an artificial limit in their API. I’ll look into this, perhaps you are right and this is a limitation of their API, but I’ll double check to make sure. Thanks! I have a question. Why plug-in needs to update catalog at installation time? Is this by design or just a side effect? On the first run, the plug-in attempts to add a metadata field to your catalog, so it can track exported photos and correctly handle the options to “replace” or “skip” previously uploaded duplicates. The operation is safe, and it takes only a second. And again, the only change it does to your catalog is add a single metadata field. This is a great plugin and on that I use quite often. I had one issue with the software and Vlaad had replied in minutes. Thanks for taking the time to create and maintain this project. Great job ! Thanks Tien! I appreciate your feedback. Thank you for the hard work and effort you have obviously put into developing this plugin. It would be interesting to see if Costco is willing to licence this from you to expand the breadth of their offering. I had assumed that no such plug in existed and stumbled upon this by accident when searching for the Costco Canada ICC profile. Thanks for your comment. As we all know, big corporate wheels turn very slow. Many online photo labs haven’t yet realized that open API and photo management plug-ins could give them the much wanted competitive edge. tired to upload, plugin informed me i needed an upgrade. Did the manual upgrade and all is well. Thanks for keeping the plug in updated to work with the changes Costco made.